Hailey City Engineer Tom Hellen has proposed that two blocks of sidewalk be constructed along Woodside Boulevard connecting to the Woodside Elementary School sidewalk system. Hellen made the proposal during a Hailey City Council meeting on Monday. Council members expressed support for the proposal, but left undecided details as to what type of sidewalk and how to fund the project. The suggestion of a sidewalk comes in the wake of multiple complaints about increased traffic and speeding in the area. 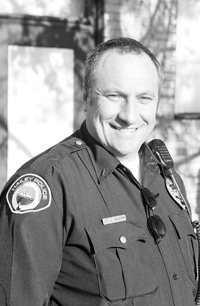 Hailey Police Chief Jeff Gunter said he has acknowledged the concerns by putting more police on the street, and believes "feedback has been generally positive." Hailey residents, however, beg to differ. One resident, Dustin Arnold, contended that the problem is not Woodside Boulevard, but other streets, in particular Glenbrook Drive. "There is not one stop sign on (Glenbrook), and because of the stop signs on Woodside, people drive on Glenbrook and speed through," Arnold said. Gunter countered that volume, not speed, is the issue. "We have done a number of speed studies," he said. "All with favorable results. The speed range was generally acceptable with just a couple out of line. The main issue is volume of traffic, and that is just what happens when a city grows." To explore further options, a neighborhood meeting will be held Tuesday, June 5, at 6 p.m. at Hailey City Hall.